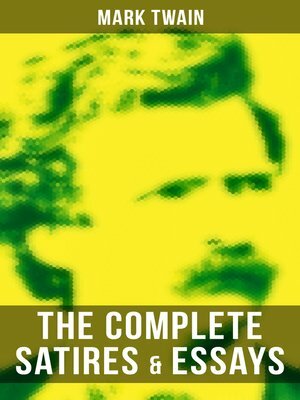 Musaicum Books presents to you this carefully created volume of "The Complete Satires & Essays of Mark Twain". This ebook has been designed and formatted to the highest digital standards and adjusted for readability on all devices. Contents: How To Tell A Story And Other Essays; How To Tell A Story; The Wounded Soldier. ; The Golden Arm. ; Mental Telegraphy Again; The Invalid's Story; A Salutation Speech From The Nineteenth Century To The Twentieth; The Battle Hymn Of The Republic, Updated; To The Person Sitting In Darkness; Private History Of The "Jumping Frog" Story; Fenimore Cooper's Literary Offences; Running For Governor; Stirring Times In Austria; Concerning The Jews; Comments On The Moro Massacre; Carl Schurz, Pilot; Taming The Bicycle; To My Missionary Critics; King Leopold's Soliloquy; The United States Government And The Congo State. ; In Defense Of Harriet Shelley; Essays On Paul Bourget; What Is Man? ; The Death Of Jean; The Turning-Point Of My Life; How To Make History Dates Stick; The Memorable Assassination; A Scrap Of Curious History; Switzerland, The Cradle Of Liberty; At The Shrine Of St. Wagner; William Dean Howells; English As She Is Taught; On Girls; A Simplified Alphabet; As Concerns Interpreting The Deity; Concerning Tobacco; The Bee; Is Shakespeare Dead? ; The United States Of Lyncherdom; Letters From The Earth. Mark Twain (1835-1910) was an American humorist, satirist, social critic, lecturer and novelist. He is mostly remembered for his classic novels The Adventures of Huckleberry Finn and The Adventures of Tom Sawyer.